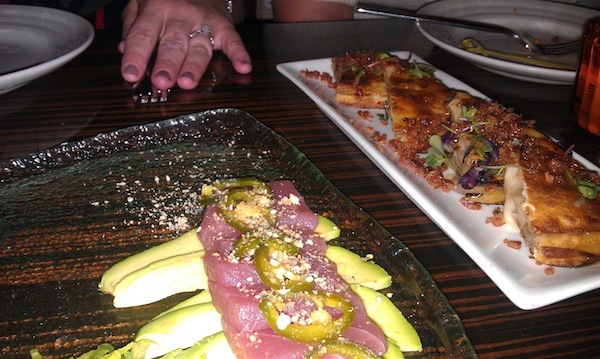 Stanton Social & I <3 Mahi Mahi | Run, Lindsay, Run! Since I don’t quite feel ready to race the Healthy Kidney 10K tomorrow, I’m going to write about some other things rather than focusing on the race. Probably not a smart pre-race strategy, but I am trying not to stress about it too much and instead, focus on using this race as a great first 10K and last strong effort before next weekend’s Brooklyn Half Marathon. I also find it rather hard to believe that I have never raced a 10K before. I have done them for tempo workouts in the past, but never a race. Definitely not in top shape at the moment, so here’s to hoping I can break 42 minutes! Earlier this week, I was lucky enough to enjoy a great dinner with a client at a restaurant I have been dying to try, Stanton Social. Oh my goodness, this was so good. 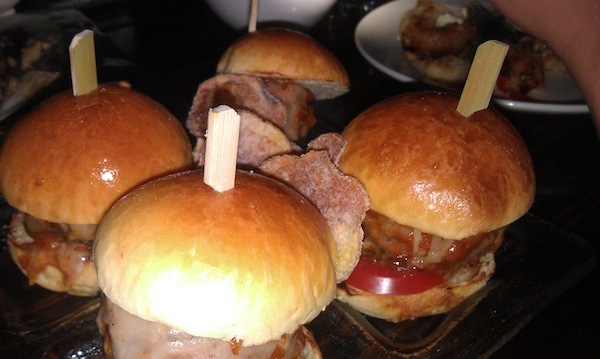 It is a sharing style menu, which meant we got to enjoy many little bits of many little items. 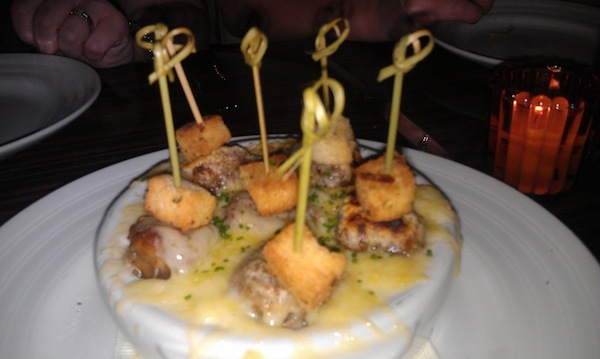 Pardon the quality of these photos, it was dim and I took them with my camera phone. We also tried the fries, sweet and sour chicken and cashew spring rolls, red snapper tacos and essex street pickles but somehow I missed pictures of those. Oh my god. I was in a food coma for hours but it was SO GOOD. I have never tried mahi mahi before, but I do want to try to incorporate more fish into my diet. I am not a big salmon lover, and I heard mahi mahi isn’t overly fishy (which I hate) and burgers seemed pretty hard to screw up. So tonight I threw a burger in the toaster oven and cooked for about 20 minutes total from frozen state, while chopping up tomatoes, avocado and mango for topping. After the mahi mahi burger was done, I squirted a bit of lemon juice on top for flavor. It was delicious! I am definitely hooked on these, and the tomato, avocado and mango were the perfect toppings. Hopefully the protein, fat and carbs (I may have snacked on a bit bunch of granola while waiting for it to cook) will be good pre-race fuel. What plans do you have for this weekend? Are you a seafood lover? If so, what’s your favorite kind? I am running the 10K tomorrow morning, and then hopefully relaxing the rest of the weekend since the forecast looks like it’s going to be quite rainy! I am trying to eat more seafood since it’s so good for you. The only seafood I like are shrimp, scallops, and lobster…and now mahi mahi! Good luck tomorrow! Even if you’re not feeling confident about the race, I’m feeling confident FOR you. You’re going to do great! Sleep well! Wahhhh, I miss Trader Joe’s already! Haha. 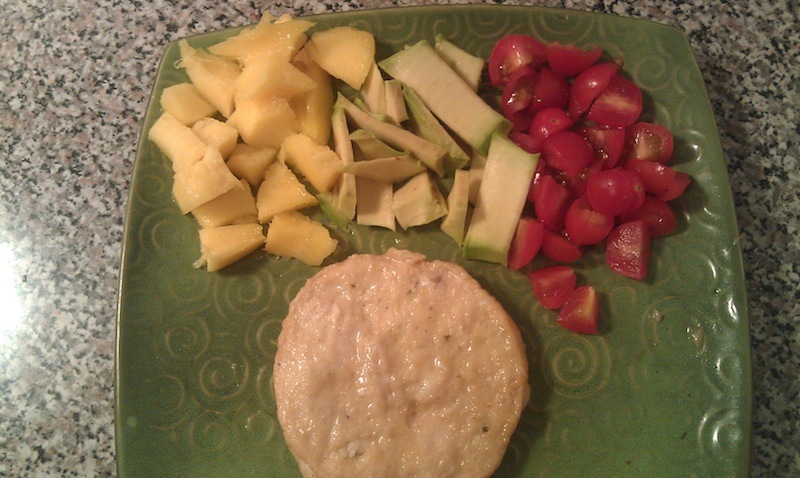 I made those Mahi Mahi burgers a few months ago and served with TJs peach salsa. They came out delish! 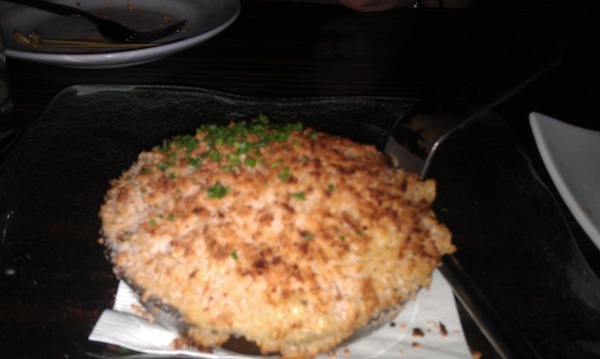 I also really liked the panko breaded tilapia. The ahi tuna steaks are also good with a little bit of lemon juice. You are definitely gonna break 42 without a doubt! Have a fun time racing in the am! 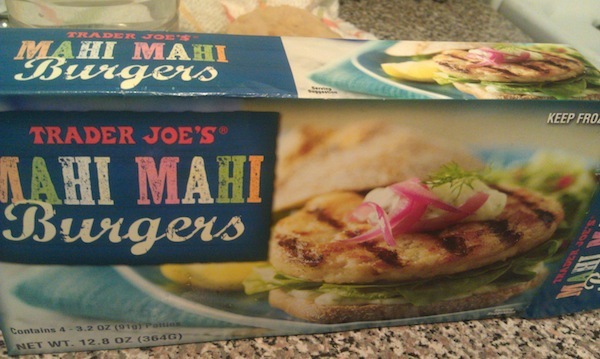 So funny, I just bought that exact package of mahi-mahi burgers from Trader Joe’s on Monday night. They were pretty good! We put some lemon juice and mayonnaise on them with some whole wheat buns. I’m pretty sure you’ll break 42 considering how fast you ran the half you just did. Um I’m pretty sure you rocked the race! I look forward to hearing about it 🙂 Wow what a nice client dinner. Glad you got to enjoy some good food. Those doughnuts look mmmmmmmm good. 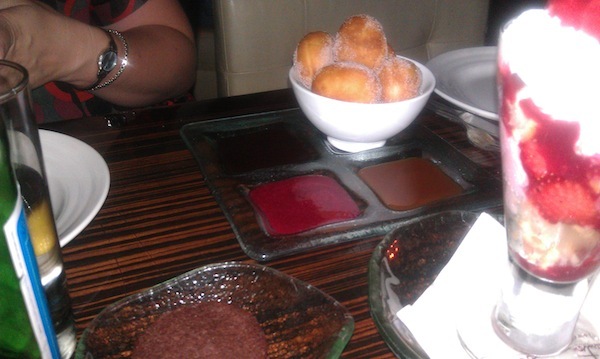 Why is it that doughnuts taste so much better at fancy restaurants? Enjoy the weekend! You pretty much killed it – congrats! P.S. The photos from your Cali trip are awesome!